In this video I present 5 vegan cheese recipes. It is a lot easier to make vegan cheese then it may seem. It is considerably easier then making traditional cheese. Basically after you make the rejuvelac everything goes by pretty quick. I learned all of these recipes from an amazing book titled Artisan Vegan Cheese. I’ll specifically make basic cashew cheese, chevre (Goat Cheese), Brie, Sharp Cheddar and Mozzarella. The recipes are also typed out below after the video. Special Note : Make sure everything you use is properly sterilized through boiling in hot water with 2 Tbsp of bleach per gallon for 10 minutes or more. Never touch anything that is going into the cheese with your bare hands. This will stay good for 2 weeks in a zip locked bag. 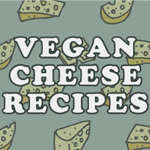 I use it in the following vegan cheese recipes, but for each one the cheese will be set out at room temperature for different periods of time. Sitting out the cheese is known as cultering the cheese. Refrigerate the above mixture for about 5 hours before eating.